UNESCO has launched a set of manuals to facilitate capacity building of library and information professionals and researchers. 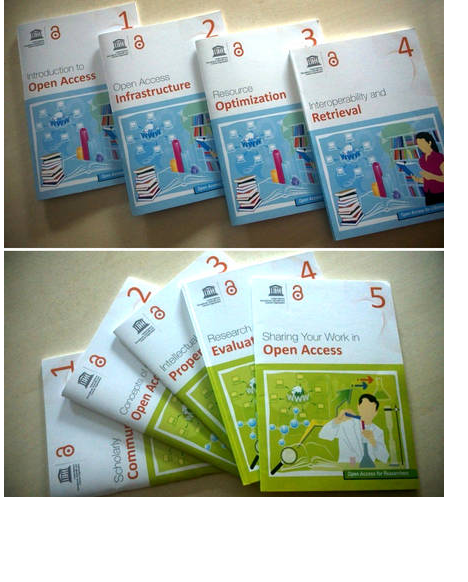 The curricula for Library and Information Science Professionals entitled “Open Access for Library Schools”, consists of four course modules. An Introductory Module aims at sensitizing the library community about the history, evolution, forms and impact of OA within the domain of scholarly communication environment and covers issues related to rights management, IPR and advocacy. The remaining three modules cover subject areas of OA Infrastructure, Resource Optimization and Interoperability and Retrieval. These sections give insights into the features, types, maintenance and standardization of OA resources, information retrieval/storage software and highlight the role of the new dimension of web-enabled resources such as e-journals, e-repositories and ICTSs. The curricula for researchers entitled “Open Access for Researchers” addresses OA issues within the community of research scholars. The modules cover the subject areas of Scholarly Communications, Concepts of Openness and Open Access, Intellectual Property Rights and Research Evaluation Metrics. The first four modules have been developed to nurture researchers with an elaborate understanding of the genesis, objectives, processes, types and existing limitations of OA scholarly communication, which include insights into the issues related to IPR, the methods and limitations of the process of peer reviewing and the concepts and roles of E-journals, databases, ICTs, OSS and other OERs. The final and fifth Module entitled “Sharing your Work in Open Access” provides a step-wise guideline for researchers about the process and options available for publishing their research work.